At 11 weeks old, Kai, a golden retriever puppy, ricochets from spot to spot enthralled with another new environment to explore. The animated bundle of caramel fluff is still too small to fill out his bright yellow service vest. Bryant, a mature 21-month-old, settles under a bench quietly watching. His toffee-colored fringe ruffles in the slight breeze. Kai is beginning his first adventure; Bryant is heading off to his next one. These pups have been specially bred as part of Canine Companions for Independence. 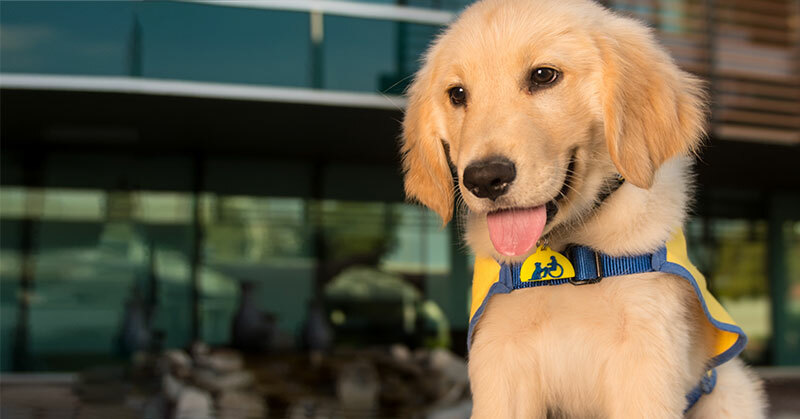 Jennifer Heller, president of the Valley of the Sun Chapter of Canine Companions for Independence reports that 28 CCI pups are being raised in the Valley. The dogs get together twice a month at the Ability360 Center for socialization and group training. 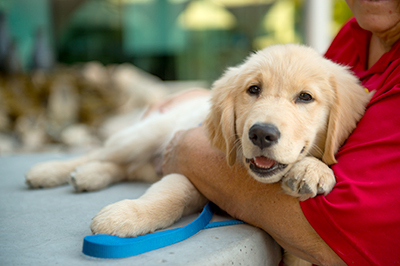 “The program, founded in 1975, breeds Labradors and golden retrievers as assistance dogs,” Heller said. “It costs about $50,000 per dog for our graduate program to raise a puppy to a service dog,” Heller said. “The dogs are paired with their handler at no cost to the graduate.” Heller is raising a Golden Retriever named Mina who will graduate in the next cycle. At eight weeks old, CCI puppies live with puppy raisers and learn basic obedience and social behaviors. Kai will spend the next year and half learning valuable skills from ‘sit’ and ‘stay’ to how to act in a restaurant. Who will Kai and Bryant grow up to be? Pat Lawson has been raising CCI pups since 2002. She’s lovingly nurtured a dozen puppies into adulthood. She’ll teach Kai about 20 commands along with social behaviors in their time together. “I do this to watch a person with a disability have more ability when they get my dog,” Lawson said. When Kai was born, his future human began the process of meeting him. After completing an extensive application that includes medical and psychological screenings and a trip to California for an interview, this person will get a phone call to meet Kai. Bryant is six months away from meeting his. “Saying goodbye to Bryant is going to feel horrible,” Kerry Saxby said. Bryant is her seventh dog since 2004. After two weeks of learning to work together, they will leave the facility to begin their new life as best friends. He will be a companion and lifeline; devoted to and adored by his human. Ken Browne has been with his seven-year-old black Labrador, Kiley, for five years. Browne has a hearing loss and mobility issues. “Before, I felt isolated and I didn’t want to go out in public alone because I couldn’t hear,” Browne said. Kiley picks up dropped items and alerts him to sounds with a gentle nudge of her nose. 78-year-old Bobbie Roth echos that. She’s been with Darcy, her fifth service dog, for about eight years and raised goats in Gilbert since the 1980s. Living with Ehlers Danlos syndrome, Roth experiences balance issues and painful dislocations of her major joints. “Darcy’s so gentle. She grooms the babies and lets them lay on her,” Roth said. Roth says her independent life would be impossible without Darcy’s help. The dog helps her conserve energy by fetching items, and prevents dislocations by opening doors and livestock gates. Darcy is Roth’s second CCI-trained service dog, succeeding Glory. Roth says her service dog is capable of evaluating a situation and acting. Once when Roth was walking her property alone, she had a dislocation and fell. Glory tried to help Roth rise and when they were unsuccessful, she independently fetched the phone and Roth called for help. Sometimes, all these dogs need to be is a calm, supportive presence. 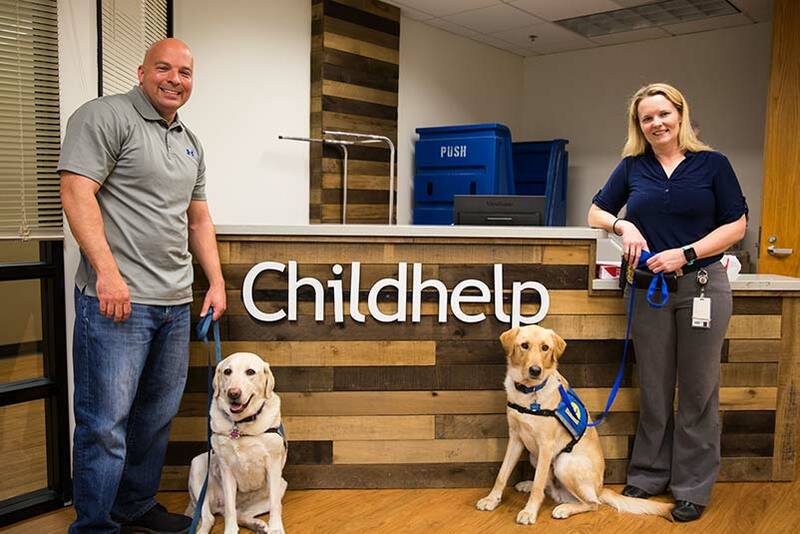 The Phoenix Police Department uses two CCI- trained facility dogs in their family investigations bureau. The program began in 2011 with Calhoun and Detective Joy Lucero who saw the benefit of service dogs in interviews and created the Phoenix program. Detective Rich Yackley and six-year-old Leona, a golden Labrador, have been partners for four years. They’ve done 35 to 40 interviews to date. Phoenix Police Detective Jamie Gonzalez carries a large lint brush along with her badge and walkie-talkie when introducing her partner, Gibson, a lab/retriever mix. Gonzalez and Gibson are the newest team in FIB. He’s been with her for about six months. They’ve done four interviews so far. Gibson and Leona are not just for kids. From puppy to partner, these beautiful creatures are born to bring joy and opportunity to the lives of their humans and, in Gonzalez’s case, the people around her. Jennifer Longdon is a Phoenix-based writer, speaker and advocate.